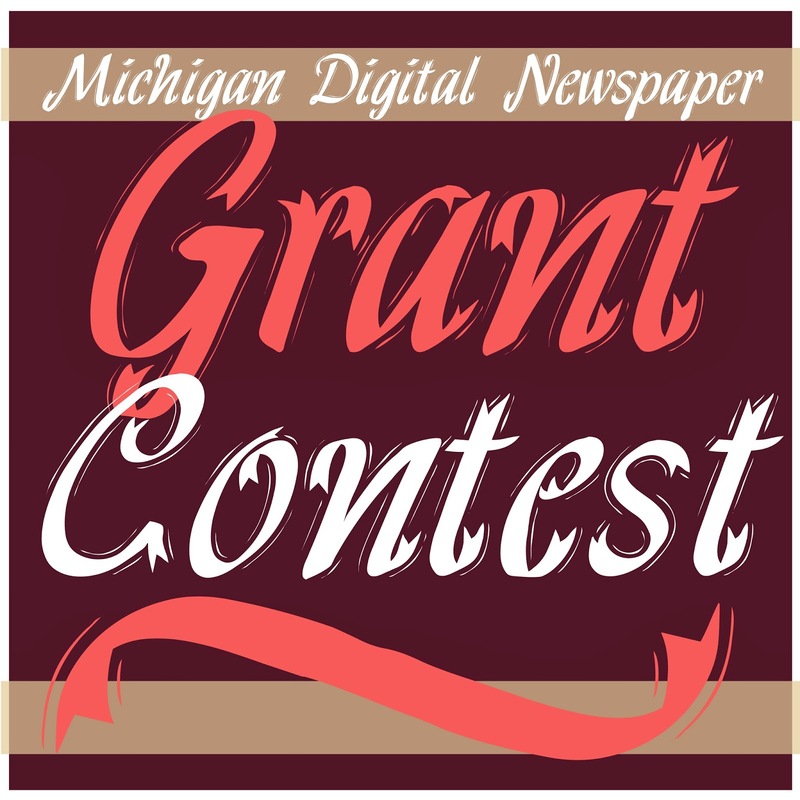 One of the following five cities will have their chosen newspaper digitized and placed online through the Clarke Historical Library’s Michigan Digital Newspaper Grant Program. The winning city's paper will be available on the Michigan Digital Newspaper Portal at condor.cmich.edu. You get to decide which community will get their papers digitized and placed online. Cast your vote between April 1-April 15 at digmichnews.wufoo.com. To keep up on the vote tally, follow us on our Facebook and Twitter. Theodore Roosevelt split the Republican Party when he ran as a Progressive in the election of 1912. The split led to the Democrat Woodrow Wilson taking the White House. It was an unusual campaign, to say the least, which included an attempt on Roosevelt’s life. John Flamming Schrank, who shot Roosevelt as the candidate was leaving the Gilpatrick Hotel in Milwaukee, claimed the ghost of William McKinley had directed him to do so. Roosevelt shrugged off the wound as not serious (though the bullet remained in his chest the rest of his life). What he could not shrug off so easily were the many attempts at character assassination that dogged him throughout the campaign, especially the repeated charge that he was a drunkard. Roosevelt finally decided to do something about the charge of drunkenness and to silence, once and for all, the libelous press. He made his stand in, of all places, Marquette, Michigan, where he brought suit against George Newett, an Ishpeming newspaper publisher. Newett had charged in the local paper, The Iron Ore, that Roosevelt lied, cursed, and drank to excess. Roosevelt gathered together a host of supporters, and they made their way to the small shipping port on Lake Superior. There, Roosevelt’s lawyer, James H. Pound, took command of the courthouse and overwhelmed the defense with character witnesses and expert opinion. Q. Now, I wish you would describe in your own way to the jury, what, if any, use you make of liquors, spirituous or malt, since your manhood, in your recollection. A. I do not drink either whiskey or brandy, except as I shall hereafter say, except as I drink it under the direction of a doctor; I do not drink beer; I sometimes drink light wine. Q. Let me ask you right there, have you ever indulged in porter on any occasion? A. I never drank liquor or porter or anything of that kind. I have never drunk a high-ball or cocktail in my life. I have sometimes drunk mint juleps in the White House. There was a bed of mint there, and I may have drunk half a dozen mint juleps a year, and certainly no more. Then followed a train of twenty-five character witnesses. Among them were: two former Rough Riders; an admiral and an ex-secretary of the Nary; a member of the Associated Press; a naturalist from the Smithsonian; members of the United State Secret Service; the social reformer Jacob A. Riis; President Garfield’s son James, who had once served as Secretary of the Interior; Gifford Pinchot, first Chief of the United States Forest Service; Dr. Alexander Lambert, Roosevelt’s family physician, and Dr. P.M. Rixey, Surgeon General of the United States; All these and many more either took the stand or, like Roosevelt’s butler and his former barber, submitted written depositions, testifying to TR’s abstemiousness. Under this barrage of high-mindedness Newett was brought low—bully!—and he recanted. Roosevelt then waived his right to damages. He had waged this battle on moral grounds and had achieved his purpose before God and the electorate. Hence forward U.S. presidential campaigns would be free of gossip and slander. One of the witnesses, the New York banker W. Emlyn Roosevelt, a cousin and close friend of Roosevelt, later had the transcript of the successful suit privately published. 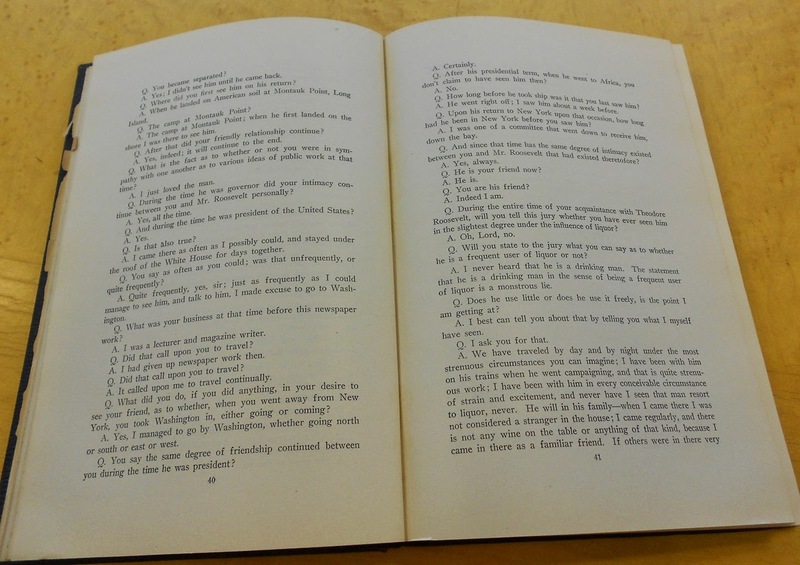 Recently the Clarke Historical Library acquired a copy of this publication: Roosevelt vs. Newett: A Transcript of the Testimony Taken and Depositions Read at Marquette, Mich. It is 361 pages long. A letter signed by Roosevelt and addressed to Dr. Albert Shaw, the editor of the “Review of Reviews” and one of the men who submitted a written deposition at the trial, is tipped into the front of the book, indicating that originally this was Shaw’s own copy. The book has value beyond being a description of the trial. 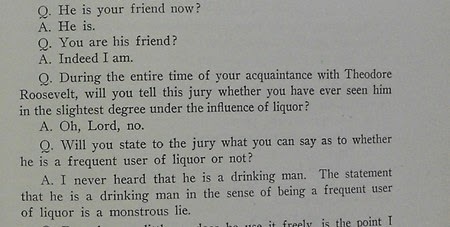 Pound fashioned his questions to establish the credibility of the witnesses. He asked questions that explored their backgrounds and explained their relationships to Roosevelt. Jacob Riis, author of How the Other Half Lives was a great admirer of Roosevelt, and earlier he had praised Roosevelt in a campaign biography: Theodore Roosevelt, the Citizen. Riis’s firsthand testimony, given in Marquette, reveals more than his distant respect for Roosevelt. It makes clear the strength of the bond of friendship between the two men. 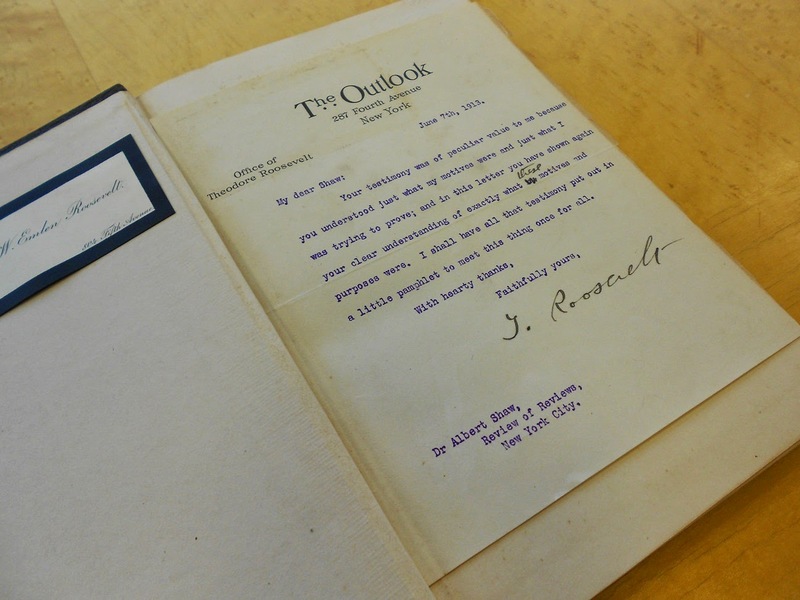 With the Clarke Historical Library’s interest in Michigan history and presidential campaign biographies, Roosevelt vs. Newett has found a welcome home in the Clarke collection. On March 17, William Rapai, author of The Kirtland’s Warbler: The Story of a Bird’s Fight Against Extinction and the People Who Saved It, presented a moving tribute to the men and women who saved Kirtland's Warbler from extinction. His book adds the story of a community that embraced the project despite tragedy. Kirtland’s Warbler is a Michigan bird, and a persnickety one. It nests in a relatively small, twelve county area of north-central Michigan among young jack pines. Not only is the bird persnickety, so too is the tree under which it nests (Kirtland’s Warblers build their nests on the ground). Jack pine seed cones only open in the presence of intense heat – usually a forest fire. Fire literally clears the field of competing species, allowing jack pines to seed and grow. One of the following five cities will have their chosen newspaper digitized and placed online through the Clarke Historical Library’s Michigan Digital Newspaper Grant Program. The winning city's paper will be available on The Michigan Digital Newspaper Portal at clarke.cmich.edu. You, the voters, get to decide which community will get their papers digitized and placed online. Cast your vote between April 1 and April 15 at digmichnews.wufoo.com. To keep up on the vote tally, follow us on our Facebook and Twitter. The voting site will include a description written by the paper’s nominator and reasons the nominator believes it should be digitized. Read excerpts from the nomination applications below. To view the full applications, visit digmichnews.wufoo.com on or after April 1. In total, 31 nominations were received, demonstrating the widespread need to make historic Michigan newspapers available online. 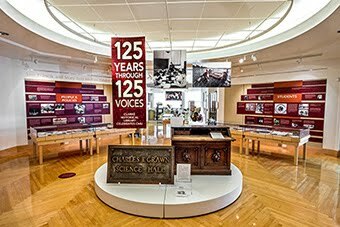 Funding for this program is made possible through the Robert and Susan Clarke Endowment, found in Central Michigan University’s Clarke Historical Library. To see our newspapers online, visit condor.cmich.edu. 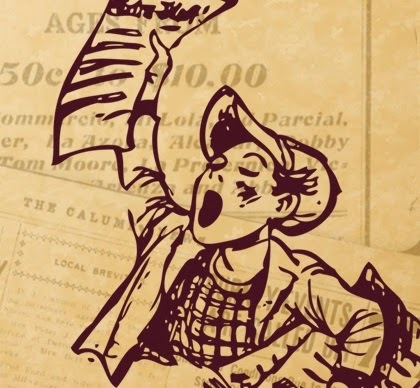 For many immigrant groups to this area from places such as Quebec, the Northeast, and places like Sweden, France, Poland, and Germany these newspapers provided a solid link for those for those in the present to connect with their past. Those of Native American heritage will also find valuable information in their pages. What is more, these newspapers provide what is essentially the only reliable source of information about Duncan City, a lumbering community of over 500 people that was once the seat of Cheboygan County. This town had the largest lumber mill north of Bay City; today, there is almost no trace that this community ever existed. The special features or unique aspects of The Grand Rapids Herald are many. First, future Senator Arthur Vandenberg was the Editor in Chief of the Grand Rapids Herald from 1916-1918. Second, the Grand Rapids Herald was one of the two primary newspapers of the city of Grand Rapids. Third, the Grand Rapids Herald was the Society newspaper of Grand Rapids. Fourth, from 1916 to 1918, Grand Rapids saw the emergence of several important political figures who were to figure prominently in city, state and national politics. Finally, during this time period, Grand Rapids was to see its very political structure change. It is these features and aspects that are unique to the Grand Rapids Herald. The Lansing State Republican reflected the views of the Republican Party just prior to and during the Civil War. The editors and owners made their views on slavery and the abolition movement very clear in this capital city newspaper and these views were then carried throughout the state. We believe that people have an interest in the industrial age of our country. Iron mining, copper mining, and timber harvesting are a part of this history. There is a resurgence of mining in the north-central Upper Peninsula. As a country, we seem to be keenly interested in regaining some of our lost industrial might. In addition to the human side, and the local history aspect, the stories found in historic Mining Journal issues are an excellent resource to tie the past into our present and future ambitions. Muskegon County has a unique and rich history in its demographics, labor migration, industrialization, logging, nautical activity and transportation. As the only Michigan deep water port on Lake Michigan and as the largest coastal city, Muskegon was very important in the development of the west side of the slate from the 1850s until after World War II. On March 5, Don Faber, biographer of Michigan’s first elected governor and the author of, The Boy Governor: Stevens T. Mason and the Birth of Michigan Politics, shared the history of a remarkable individual who was extraordinarily successful as a young man. Mason was part of Virginia’s successful Mason family, which included a member of the constitutional convention and two U.S. Senators. His father, John Thomas, had struck out to Kentucky. It did not go well, and eventually he used his family connections to gain an appointed position. He was named Secretary of the Michigan Territory and John Thomas, along with his son Stevens, traveled to the territory’s capital, Detroit. John Thomas soon decided Michigan was not to his liking, resigned his appointment, and traveled south to find his fortune in Texas. 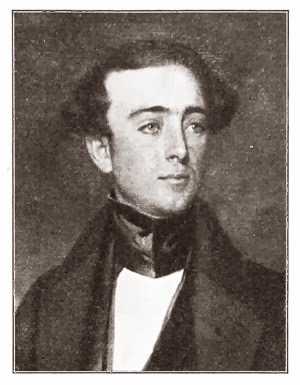 The Territory’s governor, Lewis Cass, had taken a liking to Stevens, who although only nineteen proved a far more adept politician than his father. With Cass's support, in 1831 Stevens T. Mason was appointed to succeed his father as Territorial Secretary. The appointment of the young man raised more than a few eyebrows, but he proved both administratively and political adept. Cass was soon tapped by Jackson to join his cabinet, and the young man found himself acting territorial governor. Indeed he “acted” as governor for the next several years, since the man Jackson appointed as territorial governor, George Bryan Porter, had business interests in the East that made him a very infrequent visitor to Detroit. When he did visit, Porter showed extraordinarily poor timing. In particular, arriving in the middle of a cholera epidemic, a disease which soon led to his death. As a result, President Jackson appointed the young Mason governor. Jackson lived to regret the decision. Mason was a strong proponent of Michigan becoming a state and used his authority to move that cause forward. The major roadblock to this happening was conflicting claims between Michigan Territory and the state of Ohio over the “Toledo strip,” an approximately 400 square mile piece of land that included the city of Toledo. The dispute formally centered on cartography. By act of Congress, the border between the two entities was a straight line beginning at the southernmost point of Lake Michigan and travelling east until it reached Lake Erie. The problem became that both Michigan and Ohio hired surveyors to mark that line, and both surveys put Toledo squarely in the territory of the governmental unit which paid for the survey. What really was at stake was economics. Ohio had authorized construction of an expensive series of canals to connect the Ohio River to Lake Erie. The most sensible place for these canals to enter Lake Erie was at Toledo, and the state of Ohio was not about to spend a considerable sum of money and then gift Michigan Territory with their canal system’s northern terminus. Into 1835, Mason, who truly believed that right, if not politics, was on his side, sought to retain control over the Toledo Strip. Andrew Jackson, given an issue that divided his Democratic Party, wished the problem to go away. When increasingly obvious messages to Mason failed to put him in a conciliatory mood, Jackson simply removed “the Young Hotspur” from office. Mason, however, was nothing if not resourceful. By 1835 the Territory had adopted a constitution, petitioned Congress for admission to the Union, and most importantly was prepared to conduct elections for state officials. Mason ran for and was elected state governor. The political reality, however, was Ohio was a state, while Michigan was a territory, and in the end, despite significant legal and moral victories, Congress served Michigan Territory an ultimatum: abandon the claim to the Toledo Strip as the condition of becoming a state. Although it took two conventions to achieve local agreement, eventually Mason and Michigan’s other political leaders acceded. Congress agreed to allow Michigan Territory to enter the Union in 1837, and, to place some salve on the wounds that had been created by its rough handling of the situation, added the western Upper Peninsula to the new state. Mason was re-elected governor in 1837 and advocated an ambitious plan for both internal improvements, including a canal at Sault Ste. Marie, and a progressive educational policy. All this came to naught, however, when the nation plunged into the Panic of 1837. The money to support Mason’s vision was simply unavailable. Mason kept the state afloat with a loan he personally negotiated in New York City, but in many ways the deal became his undoing, since when he arrived in Detroit with the trunkful of money lent to the state, some of it was missing. Although eventually all of the money was accounted for, his political opponents made much of the situation and Mason did not run for re-election. The talented young man and his new bride, whom he had met in New York City while negotiating a loan on the state's behalf, resided in Detroit until 1841, when they moved to New York City. There, in January 1843, he died of pneumonia. In a footnote, Don Faber told the strange tale of Mason’s mortal remains. Mason was originally buried in New York. However in 1905, amid much pomp and ceremony, his remains were returned to Michigan and interred in Detroit’s Capitol Park, a small strip of green in downtown Detroit that commemorates the location of the state’s first capitol building. In 1955, a decision to build a bus terminal in the park led to another relocation of the Governor’s remains. A second exhumation and reburial took place, again in Capitol Park. In 2010, new construction in the park led to a third exhumation and relocation of the by now well- traveled body. The 2010 project led to newspaper headlines when construction workers failed to find Mason’s body where it was thought to lie. Four days of digging eventually relocated the slightly misplaced former governor. Today, his remains are located above ground, in the pedestal of a statue erected in his memory that stands in Capitol Park. Don Faber’s presentation offered insight into early Michigan history, a fascinating life, and the not particularly eternal rest granted to Stevens T. Mason. 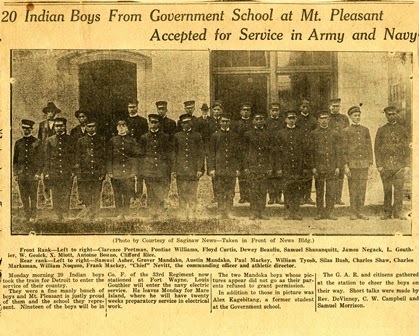 An oversized scrapbook donated with some Vernon Township (Isabella County, Mich.) records includes an undated article and photograph labeled “20 Indian Boys From Government School at Mt. Pleasant Accepted for Service in Army and Navy.” This immediately peaked my interest! I identified the piece as being from the defunct Mount Pleasant Times(MPT), June 7, 1917, page 1. I wanted to know more about these men and searched online records as well as collections in the Clarke. Most of their names are spelled numerous ways and sometimes they are identified in the records as white, other times as Indian, Ojibwe, or Chippewa. This is common for Native American research. There are records for many of the men in the census, death records, veteran burial record, Indian rolls, enlistment records, veteran hospital records, and school records. Eight men had some type of enlistment records and all enlisted in Mount Pleasant on June 2 or 4, 1917: Samuel Shananquitt, James Negack, Clifford Rice, Samuel Asher, Paul Mackey, Silas Bush, Charles Marksman, and Alex Kagebitang. Why June 2 to the 4? Registration Day in Isabella County for the draft was Tuesday, June 5, 1917. All males between 21 and 30, except for a few exceptions, were to register (MPT, May 31, 1917, p.1). Three men listed in the article, Dewey Beauliu, Charles Shaw, and William Noquon, remained elusive. Two brothers, Grover and Austin Mandako, wanted to enlist but were prevented from doing so by their parents. Frank Mackey died in France of wounds from battle in August (must be 1918). He is the only man who died during the War. L.[ouis] Gouthier is mentioned in the article, but not in other records. Other men in the image who enlisted were: Floyd Curtis, Clarence Portman, Clarence Portman, W. Gesick (Wasso or Owosso Geshick? ), Xavier Miott, Antoine Bonno (Antoine A. Bonneau? ), and William Tyosh. Also listed was the athletic director “Chief” Nevitt. The Clarke has an extensive amount of documents from WWI as part of our holdings. If you are interested in seeing original WWI propaganda posters for the U. S. Food Administration, buying Liberty Bonds, or donating books to the men on the front, check out the hallway exhibit case in the first floor corridor of the Park Library at Central Michigan University.